As mentioned in a previous post, my father bought and restored a 1922 Chevrolet that we nicknamed “Yellow Bird”. This car is like a family member to us – and some of our favorite memories as a family were when we’d participate in Antique Car rallies and caravans. It’s likely a little known fact that there is an Antique Automobile Association with chapters all across the United States. The chapter our family belonged to would have rallies at least once a year and caravans/informal rides multiple times per year. 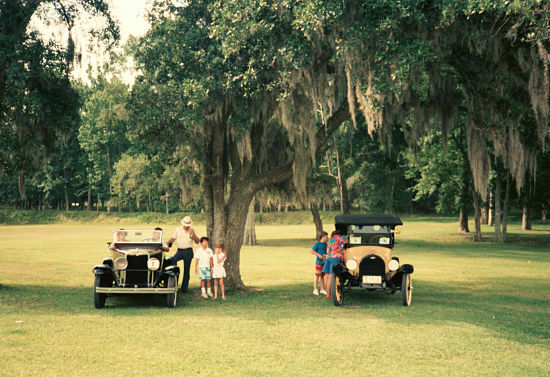 The informal rides were where we’d gather with a group of other antique car enthusiasts and caravan to a location. The caravan rides didn’t have rules like the rallies – they were more informal and more frequent. The caravans were fun, but the rallies were the main event. An antique car club rally isn’t a race in the traditional sense. I’ve done my best to explain the rules and process below to give you an idea of what was in store for us as we cruised the backroads of Louisiana in an open air car, usually at the end of May – one of the hottest months of the year. The route is a secret to participants. Instead, they are given clues to look for along the route that will reveal where they need to turn. The clues also help to verify that they are on the correct route designed by the rally organizers. The clues along the route also indicated at what speed you were instructed to drive at during the course of the route. There were checkpoints along the route and your time between 2 checkpoints was measured and noted. In addition to the route clue sheet, each car was also given a list of questions that you would answer as you traveled along the route. Think of it like a miniature scavenger hunt. The clue may say “What color was the sign that said ‘Go Forward’?” and you’d have to fill in the answers to the questions. You’d turn in your answer sheet at the last checkpoint and the number of correct answers would contribute to your overall score. The winner of the rally was the person who completed each check point leg in the closest time to the pre-determined time. Your overall course time was also calculated. So, if you completed the route in 3 hours, someone who completed it in 3 hours, 10 minutes would be closer to the winning position that you are because their completed time matched more closely to the time it should have taken for them to complete the route. Lastly, the answers to the questions would be tallied and contribute to your overall score. The results were announced that evening during a banquet meal – usually at a local hotel where the rally was hosted. Clear as mud? Right. Try explaining that to a kid – “No, we don’t want to speed. Even if we’re there first, it doesn’t mean we’ll win.” What the what? What kind of race is this? The funny part is that was a favorite family activity of ours. Throw in the temperament of old cars – their likelihood to break down and overheat and you have quite the adventure.